Recently, I read an interesting post from Simply Measured about @HyattConcierge Twitter Customer Service metrics. The article started the brain flywheel spinning with thoughts on what do customers see as acceptable and superior service levels. Which tweets or social posts should be replied to? How quickly should a tweet or social post be responded to? Should the brand or company always reply? What are customers’ expectations on business hours? See full article here, please also see their live report. 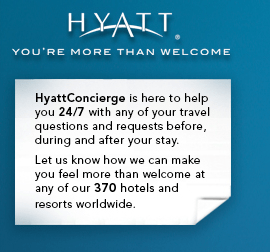 The post states @HyattConcierge Twitter response time goal (service level) is 20 minutes. Their business hours are 9-5 (I am assuming Central Time since they are headquartered in Chicago). 20 minutes? In 20 minutes, I can walk down 10 flights of stairs and resolve my question at the front desk, plus I will be tired and aggravated. And only 9-5? Usually when I stay at a hotel, I am there more than just the hours of 9-5. Their Twitter page shows them available 24/7? I am happy to see that Hyatt has the ability to monitor these metrics, and has service level goals. But are they the right goals? In my humble opinion, these sound like service level goals created by what the company wants or can do, instead of starting from the customer’s point of view. It would be interesting to me to know if their social customer service is handled and lead by Marketing, or by their Customer Service department. TIP: Before you commit to providing Social Customer Service (full time versus experimentation), you need to be clear on what your service level goals are, and set up your organization to provide those levels of service. Before I provide my thoughts on superior social service levels (because I am not in the business of having average or benchmark customer service), you need to understand you customer’s needs and expectations. Here are generic superior social service levels. Most importantly, start with your customers first, and operationalize based on their expectations (then exceed them). By starting with your customers first, you can build the organization and expectations to support their needs. Just forming a group to handle these requests/concerns/mentions may actually disappoint before they help out a customer. “Yes, it’s great you replied, but I needed your help 4 hours ago”. What do you feel are superior social customer service goals? Do you have service level goals for your social customer support? Are you working backwards from the customer?